Genre distributor Terror Films has teamed up with SHUDDER, the leading premium streaming service for thriller, suspense and horror, for the exclusive release of writer/director Stephen Cognetti’s highly anticipated sequel, HELL HOUSE LLC II –THE ABADDON HOTEL. 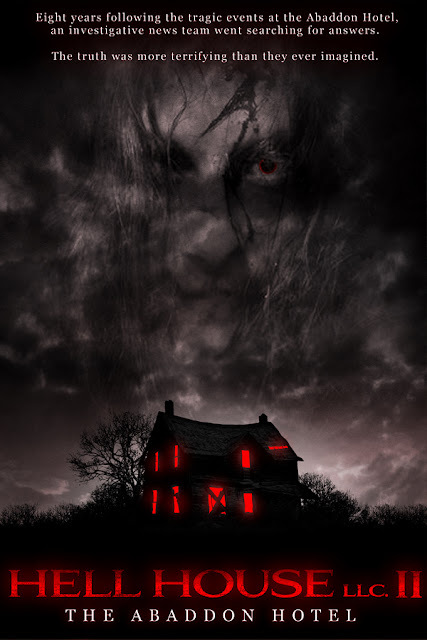 HELL HOUSE LLC, which was originally released by Terror Films in the fall of 2016, has become a top performer across digital platforms garnering both critical and consumer praise and landing the film on top “must see” horror lists from multiple outlets. The sequel will be available exclusively on Shudder for the first 90 days in the U.S., Canada, the U.K. and Ireland. As part of the release, SHUDDER is offering fans a 14-day free trial with promo code HH2TFSH – head to www.shudder.com and create an account to redeem it. Terror Films initially announced a release date of 14th September several weeks ago when they dropped the Official Trailer and Poster (NEWS HERE). That date has since been pulled. The film will NOW premiere exclusively on Shudder on Thursday, 20th September 2018. Terror Films will make the film available on Friday 4th January 2019 in multiple territories on iTunes, Amazon Instant and Vudu with additional platforms to follow at a later date. If you haven’t already seen it, be sure to check out the official trailer below. OH MY GOD ...OH MY GOD ... OH MY GOD I'm SOOOO excited I LOVE THIS movie! !